Having a hard time getting your landing page visitors to convert? This 20-point landing page audit will identify the weak areas on your landing page and show you exactly how to fix them to improve your conversion rates immediately. Whether they're B2B, B2C or eCommerce, this is the audit sheet we use for our clients and our own landing pages that has resulted in a 29% average conversion rates. A simple and fast way to improve your landing page conversions. Landing pages are a major contributor to the success of your lead generation efforts, so why wouldn't you pay attention to the details that go into building a high converting landing page? 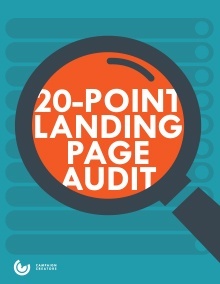 To get the FREE 20-point audit fill out the form above and start improving your landing page today! "Anyone would be impressed with how the Campaign Creators team goes the extra mile." "We wouldn't be where we are without them. From day one they have exceeded expectations."